Plenty of surprises in opening Round of the WSK Euro Series at the Circuito Internazionale di Napoli. The winners were: William Macintyre, Nikita Bedrin, Dino Beganovic and Simo Puhakka. The Senior finale, merciless, saw top drivers KO-ed. 60 MINI - In the baby category, there was no lack of reversals in the leading positions. The winner was William Macintyre (Team Driver) on an excellent Alex Powell (Energy Corse) and Andrea Filaferro (Newmann). Great comeback for Rashid Al Dhaheri (Parolin), who gained 18 positions. OKJ - In Junior, Russian Nikita Bedrin (Tony Kart) set a frenetic pace on his pursuers Thomas Ten Brinke (RFM) and Jamie Day (Lennox), who then accompanied him onto the podium. Of note, the excellent performances of Alfio Spina (KR) and Robert De Haan (Energy), respectively in fourth and fifth position. OK - In Senior, the race was marked by numerous accidents that took out some big names such as Lorenzo Travisanutto (CV Performance), Harry Thompson (RFM) and Dexter Patterson (Sauber), while the slow in the last lap ended the dreams of glory of Luigi Coluccio (Birel ART), who could not attack Dino Beganovic (Ward), first under the checkered flag. 3rd Nikolas Pirttilhati (CV Performance). The top 5 completed by Joseph Turney (Tony Kart) and Hugo Sasse (TB Racing). KZ2- In the gearbox class, a brilliant Simo Puhakka (Tony Kart) beat the Sodikart duo of Bas Lammers and Anthony Abbasse. 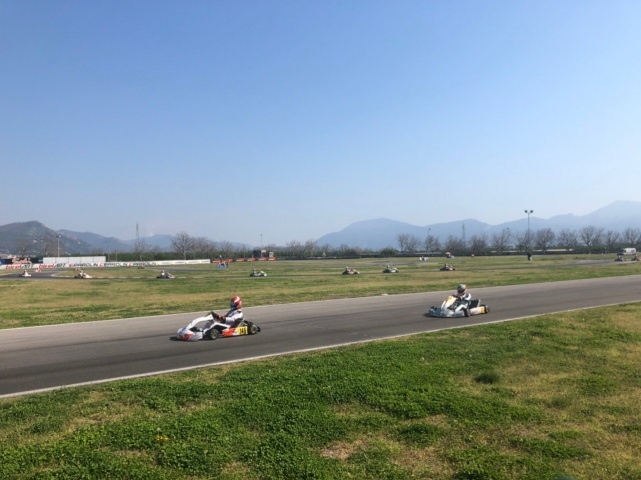 4th and 5th were Marco Ardigò (Tony Kart) and Riccardo Longhi (Birel ART).